Exile has been a spur to some of the greatest literature: would we have The Divine Comedy if Dante had not had to leave Florence and learn 'the bitter taste of others' bread'? It could be said that the whole 'rivers-and-mountains' tradition in Chinese poetry stems from the exile of Hsieh Ling-yün in 422 to the wild southern coast. Literary heroes from Prince Rama to Prince Genji have found themselves sent into exile. Just recently I was looking round the National Gallery's Delacroix exhibition which includes his painting Ovid Among the Scythians. Beyond the small group coming to the aid of the poet, there is a dark, inhospitable landscape. The banishment of a writer like Ovid can evolve into a kind of legend itself, the historical facts having become lost to us. Here I want to write about the exile of Zeami Matokiyo, banished in 1434 at the advanced age of seventy-one by the shogun for reasons that are also no longer fully clear. He was sent to the island of Sado, a place that already had a long history as a place of banishment - the great Buddhist monk Nichiren, for example, was exiled there in 1271. Zeami is famous for in the West for his Noh plays and writings on aesthetics, but 'The Book of the Golden Island' (Kintosho, 1436), which describes his journey to Sado, deserves to be better known. Arthur Waley, in his anthology The Nō Plays of Japan, wrote that Zeami's Kintosho 'bears the same relation to his plays that Basho's prose-sketches bear to his hokku.' It is shorter than Basho's travel sketches, only fourteen pages in the translation Susan Matisoff published in the Winter 1977 edition of Monumenta Nipponica, and structured in eight sections. Jakushu: Leaving the capital, Zeami reaches the port of Obama where he looks across the bay to the mountains. He had visited this place before, many years ago, but now his memories of it are uncertain. Sea Route: His boat sets sail across the northern sea to Sado. Far to the east, the mountain of Shirayama (now called Hakusan) is visible, wit hits lingering snow patches. Other landmarks are sighted as the boat travels day and night. Finally, he sees pine trees amid dawn waves: Sado. Plaec of Exile: Zeami makes his way inland and stays at a small temple where water trickles through moss and the walls are damp and weathered. He looks at the moon, a lingering connection to the capital for it can be seen from there too. Hototogisu: This section contains a story that Arthur Waley translated. The hototogisu (Japanese cuckoo) can be heard everywhere on Sado but at a certain shrine. Minister Tamekane, exiled to Sado, had composed a poem there asking the singing birds to leave because they reminded him of Kyoto. Izumi: At this place in Sado Zeami is reminded of another exile, Emperor Juntoka, whose poetry he quotes. Juntoka lived with the pure heart of a lotus and at Izumi 'must have walked the refreshing path', the road to the Pure Land paradise. Ten Shrines: Time passes: autumn, winter, and in the spring of 1435, Zeami composes a poem to the gods of the Ten Shrines. Untitled (Reaper Drone) 2010, is just as visually stunning: a late-Turner swirl of yellow light - the desert sky near Las Vegas - and caught in the image the tiny silhouette of military drone. This series of photographs, the curators explain, are achieved with a large-format camera trained on the sky: 'when the film is developed, small insect-like drones are peppered throughout the images.' There is another, Untitled (Predators), not in the exhibition, which could be a high cirrus sky over Suffolk - an ominous contemporary version of Constable's cloud studies. NSA-Tapped Fiber Optic Cable Landing Site, Marseilles, France (2015) partly comprises another large-scale landscape photograph, juxtaposed with a nautical map onto which various diagrams and images have been pinned like the visual prompts on a crime investigation board. The view of rocky islands in the bay of Marseilles inevitably brings to mind The Count of Monte Cristo, a novel that features surveillance, secret locations, political plots and, here where the NSA-tapped cable came ashore, the fortress prison where the novel's hero is cut off from all communication with the outside world. Having written this I see that the Photographers Gallery have just today posted an interview with Paglen on their website. In this clip, embedded here, he talks in front of the map of Marseille about the way his work aims to make visitors look at the world more closely and more suspiciously. This week I thought I would highlight a website called Landscape Music and the associated Landscape Music Composers Network. They are run by a Brooklyn-based artist and composer, Nell Shaw Cohen, who writes of having tried 'to achieve the sonic equivalent of what visual artists accomplish with landscape art. 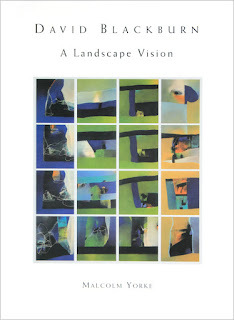 I coined the term “Landscape Music” to communicate this ideal and philosophy.' Among the projects on her CV is an app, Explore John Muir’s Yosemite. Looking through the biographies of the Network composers on her site it becomes clear that California, the American National Parks and John Muir are recurring interests. The soundcloud above, for example, is Jenni Brandon's The Sequoia Trio, 'inspired by the Big Trees in Sequoia National Park and the words of John Muir'. In this video clip you can see Rachel Panitch, another of the Network composers, playing the fiddle in Zion National Park. The film also provides an insight into the way the National Parks' artist-in-residence programmes facilitate this kind of work. Such schemes are welcome and it will be interesting to see what kind of music they give rise to in future. I can't help thinking though that the way the park authorities pay for an artist to reside in a cabin is a little reminiscent of the way wealthy eighteenth-century landowners employed hermits to occupy huts on their estates. These hermits would sometimes have to make themselves available to speak to visitors, just as the modern artist in residence needs to give occasional talks or performances. 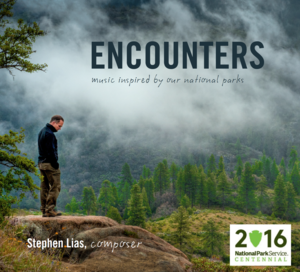 One composer, Stephen Lias, has been taking advantage of several of these residencies to build up a body of work that responds to the parks' rivers, forests, mountains and storms. Some of this music has been collected on a CD, Encounters. Stephen Lias calls himself an 'adventurer-composer' and some of his research sounds quite arduous. For the Gates of the Arctic National Park residency he was required to prove his fitness beforehand on a 10-day backcountry patrol. He has led a regular field seminar with other composers in Alaska, 'Composing in the Wilderness'. Its website advises applicants that they'll have to make do with pen and paper (no electricity) and notes that 'it is important that all participants are comfortable “roughing it” in close quarters for a few days.' Another Network composer, Justin Ralls has described being a participant on the first of these trips, reflecting on his need to get away from city life and wondering to what extent he was being a 'creative tourist' in the wilds of Alaska. It would be easy to find historical precedents for this kind of activity too in the Romantic period. Nowadays, wilderness expeditions organised for the benefit of artists are an alternative to the residency model - I have referred here more than once to the Cape Farewell trips which included composers and sound artist like Jarvis Cocker and Max Eastley. John Muir & Theodore Roosevelt above Yosemite Valley, California. When it came to making a work about Yosemite, Range Light, Stephen Lias chose to work from photographs by Ansel Adams rather than his own direct experiences of the National Park. Justin Ralls has written an environmental chamber opera, Two Yosemites, about the famous camping trip that President Theodore Roosevelt took with John Muir. His Tree Ride, for orchestra, was 'inspired by Muir, backpacking, and listening to the breath of the world in California.' He has also composed a string quartet, Tree Wavings, which derives from a beautiful passage in John Muir's The Mountains of California. A 2005 article in Frieze describes Rodenbach's use of photographs in Bruges-la-Morte, which could be seen as prefiguring Andre Breton's Nadja and the writings of W. G. Sebald. 'The images were taken from the picturesque local stock of prints and postcards sold to tourists; they picture a city almost wholly uninhabited. Occasionally, minute figures in the distance have even been excised, so that these photographs, in 1892, are already outdated, resembling daguerreotype city views of half a century earlier, with their vanished or blurred citizens. I have been looking back at some old photographs I took in Bruges almost exactly a century after the book's publication, but even with some careful cropping I don't think they would convey a sense of melancholy (I should have risen earlier perhaps, before the tourists, when the streets were empty and autumn mist still hung over the motionless canals). A modified version of Bruges is the basis for one of the most remarkable images drawn under the influence of Rodenbach, Fernand Khnopff's The Abandoned Town (1904). Here too there is an absence of people and even the statue is missing, leaving just an empty plinth. An incoming tide is starting to cover the stones of the Woensdagmarkt. Instead of having been separated from the sea, the city here looks as if it is being flooded and abandoned to the waters. I have not yet read any obituaries in the national media for David Blackburn, whose passing was reported last month in the Huddersfield Examiner. This may just be a matter of time, although perhaps he is not as well known now as he once was. There has always been a sense that he was swimming against the main currents of contemporary art, with his visionary abstract landscapes executed in pastel. Perhaps the praise he received from Kenneth Clark whilst still a student didn't help in this respect, although a quote still appears on the front page of the artist's website. Writing in 1990, Malcolm Yorke pointed out that though Blackburn had achieved a strong international following, he had not 'courted the fickle attentions of the London galleries.' I used to see small exhibitions of his work at the Hart Gallery, a little oasis among the crowds on Upper Street in Islington (now closed, and recently in the local news when squatters took over the premises). More recently he has been represented by Messum's, who in 2005 made the hour-long documentary David Blackburn Landscapes of the Mind. This includes contributions from another famous son of Huddersfield, Simon Armitage, as you can see from the slightly unfortunate thumbnail image below, where he is caught in mid-gesticulation. I read in the New York Review recently of another new translation of Murasaki's The Tale of Genji and recalled that it is not that long ago that The Pillow Book of Sei Shōnagon was reissued in a new version by Penguin Classics. Strange then that their great contemporary Izumi Shikibu (c. 974-c. 1034) remains relatively unpublished and neglected in comparison. However, anyone curious about her poetry can find a rewarding set of translations made in the late eighties and published in 1990 by Jane Hirshfield with Mariko Aratani. 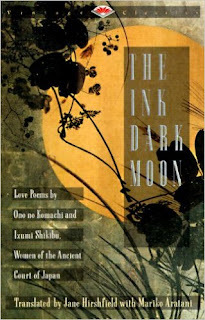 Their book, The Ink Dark Moon also contains a selection of earlier poetry by Ono no Komachi (c. 834-? ), the only woman writer included among the 'Six Poetic Geniuses' of Japan by Ki no Tsurayuki, writing in the Preface to the Kokinshū, c. 905.
a cup of green tea rescues us, grows deep and large, a lake. In other poetry the influence of studying writers like Izumi comes through in the metaphors she uses. 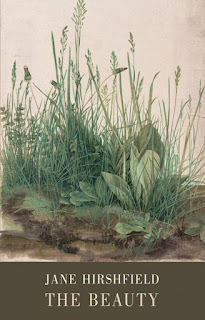 There is, for example, a poem in her collection The Beauty on 'The landscape by Dürer / of a dandelion amid grasses' (the painting appears on the cover of he Bloodaxe edition). 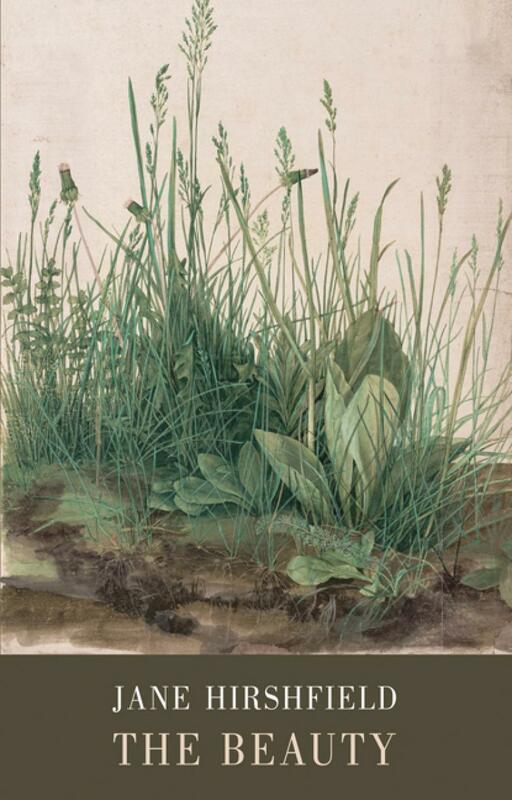 In this she sees 'exiles / writing letters / sent over the mountains' - the exiles are the flowers and their messengers the passing horses and donkeys. There are two Jane Hirshfield poems in the Bloodaxe ecopoetry anthology Earth Shattering - one of which 'Global Warming' is particularly striking (you can Google it but as ever I'm trying to adhere to fair-use copyright rules here). The clip below is a short talk on ecopoetics that she delivered in 2013. It traces environmental attitudes in literature from Gilgamesh cutting down the cedar forest, to Gary Snyder, whose haibun series 'Dust in the Wind' achieves a balance between the human and natural worlds. Hirshfield wrote a beautiful poem herself in haibun form (prose:haiku) which can be found in the collection Come, Thief. It describes walks over the course of a summer in which she sees an old man building a boat until, 'finally, today, it is being painted: a clear Baltic blue.' This boat, at rest on its wooden cradle, resembles a horse waiting in a stable. She thinks of the way horses dream and of the hopes of the old man. The brief concluding poem is simply the image of that blue boat, high on a mountain among the summer trees.